Hope you are enjoying the first couple days of fall! Our weather has definitely cooled down - and I am excited to finally be wearing some fall clothes. My buffalo plaid shirt is one of my favorites in my closet, and this one I found is only $18! Also, I wanted to mention that this look was inspired by my fellow blogging friend, Amy Ann. 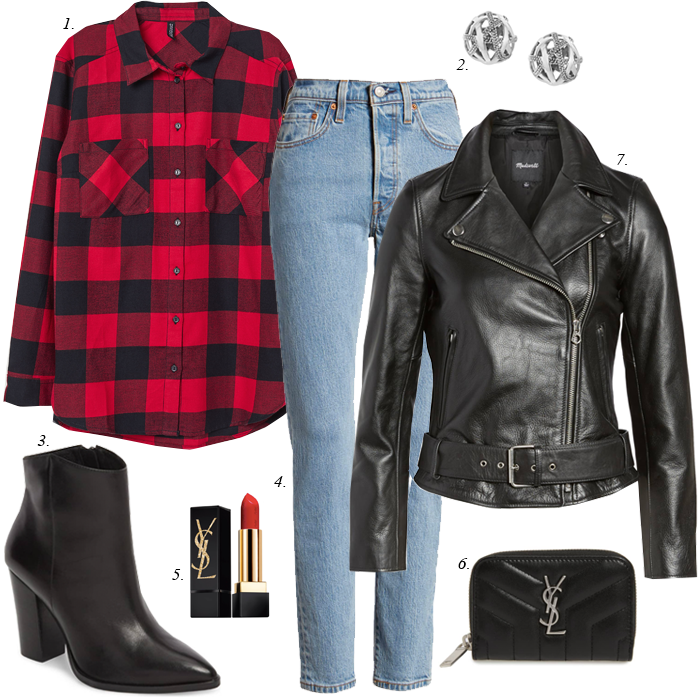 The way she styled her plaid shirt and moto jacket - prompted me to create this look. This herringbone blazer in a rich color for fall. This classic gray boyfriend cardigan. These ankle booties are an additional 40% off and only $40. I love these western boots! This cashmere hat looks so cozy. I like this tweed military jacket. This is the cutest fall tee. My favorite lipstick is on sale. I'd like to buy these boots. This plaid shirt that is on sale. These camo jeans are on sale. This new plaid blanket scarf looks so warm! A new chunky sweater for fall. A sherpa lined denim jacket - for that extra warmth this fall. A bold colored jacket for fall. A pair of western-inspired boots. A comfy new long sleeved tee - these are the softest tees. Looking some outfit ideas - check out my inspiration HERE. Such a fun look. I am wearing B&W Buffalo plaid for our link up tomorrow. Have a wonderful day!!! Oh my goodness, that fall tee from Etsy is so cute! You find the best pieces!! !